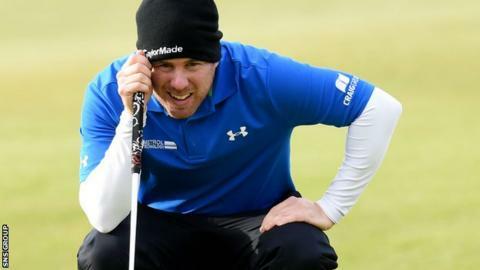 Richie Ramsay will miss this week's Alfred Dunhill Links Championship due to an eye infection. The 32-year-old from Aberdeen finished in a tie for second place in last year's event - one shot behind surprise winner Oliver Wilson. The tournament begins on Thursday across St Andrews, Kingsbarns and Carnoustie over a four-day period. Players and celebrities compete over each course for three days, with the final round at St Andrews. On Twitter, Ramsay said: "Pulled out of @dunhilllinks. My eye is still not right. Great tournament... All the best to whoever gets in." Scotland's Paul Lawrie, who triumphed at the first Alfred Dunhill Links Championship in 2001, is joined in the field by fellow major-winners Ernie Els, Padraig Harrington, Martin Kaymer, Graeme McDowell, Charl Schwartzel, Darren Clarke, John Daly, Stewart Cink and Y.E.Yang. Harrington (2002 & 2006) and Kaymer (2010) are also former winners of the tournament. This week also marks a return to St Andrews for Irishman Paul Dunne, who memorably shared the lead at The Open after 54 holes in July. The 22-year-old is making his professional debut, as is Silver Medal winner Ashley Chesters of England, after both men featured in Great Britain & Ireland's Walker Cup victory.